Single parasailing in Key West is a 60-minute event. Guests will have their choice of an individual or a double parasail. Guests can have this event customized to their liking. If they like a wild or a mild parasail they can have either. Guests going on the single parasailing in Key West should know that it is suitable for all ages. Some guests of a very young age might not find it appropriate. If they go is up to the discretion of the parents. Guests will have their choice of a single parasail or a double parasail. Guests will not need to share their parasailing adventure with anybody else. 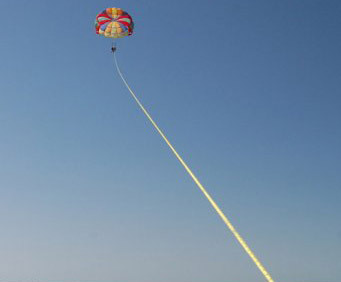 Single parasailing in Key West will allow guests to fly high above the Key West area. Guests will get to see many sites from the air. 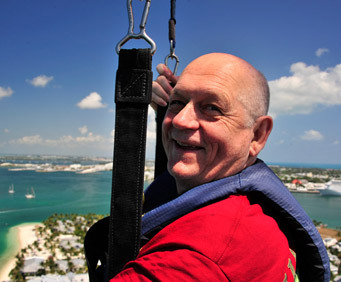 However, instead of being in a helicopter or an airplane guests will be parasailing over the Key West. They will get to see many of the oceans beauty and much of the landmarks in the Key West area. Guests are expected to get themselves to and from the single parasailing in Key West event. The event does not require any walking. However, it is suitable for all ages. It will not be wheelchair accessible. Guests should know there is no tour guide for this event. Gratuities are not necessary for this event. Single parasailing in Key West is a fun-filled family friendly adventure. It is an ideal choice for families looking for something to do. 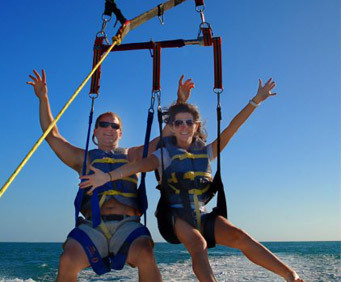 Couples looking for something to do can you use the double parasail equipment. Guests should know there is not any tour guide for this event. This event will last approximately 60 Minutes. However, the most time that a guest will be up in the air is about 15 minutes. Float high above the Atlantic waters for a bird's eye view of Florida's beautiful Key West. This single parasail adventure gives you everything you want from your vacation - the sun, the water, the refreshing sea breeze and the feeling of absolute freedom, high above all your cares. Experience the exhilaration of parasailing over paradise! Float high above the water and look out over Florida's picturesque Key West landscape. Parasailing can be done solo or tandem, and is safe for all ages! Rides can be tailored to your taste - from mild to wild. Take in stunning bird's eye views of the blues and greens of the Gulf of Mexico, palm trees and all your favorite Key West sights. This may be the best way to find a little peace and quiet in such a busy, lively a town! Actual flight time is approximately 14 minutes.